Cid Style File: TV Plus! Just read an article online that Fox is working on a reality dating type show for plus size women. The show will be called "More to Love" and the basis of the show is that "regular/normal women" will compete to find love. According to the THR interview with Mike Fleiss "Most of the country isn't a Size 2," Fleiss said. "It's the dating show for the rest of us." The show is suppose to show the world that even plus size women can be lovable and can find love. I'm all for every one needs love no matter what size you are or what you look like. I just hope Americans will accept it as a prime time show. I'm looking forward to the show, not sure when it will air. My hope is "More to Love" will show plus size women in a positive light, showing how we are all just normal women. Plus size women can be beautiful, smart and confident and worthy of being loved. Believe it or not there is many men out there who either admit to it or not, but they love women with some curves and some extra meat on them. I know, I found one who does! Maybe there is a change coming to TV, with shows like Biggest Loser being so popular, and the presence of plus size women on TV. Shows like No. 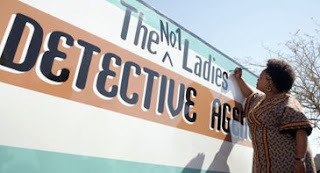 1 Ladies Detective Agency on HBO featuring a curvaceous, beautiful Jill Scott are giving plus size women more exposure and acceptance in the eyes of the media. Although we can count on our hands the number of plus size women on TV & Movies, I believe we are progressing in the right direction and can make a difference in what "we" the audience want to see. Popularity of actors like Queen Latifah in movies, is a reflection of the general population of women in the USA. We want to see us in movies and TV, most women I know are not size 2, 4, 6, 8, in fact most women I know are in the double digit sizes. So lets support our double digit sisters in movies and TV. Lets give our attention to all those plus size actresses and send a message to TV & Movie execs, we want to see more. More beautiful, smart confident and positive role models of women who represent us, the big, beautiful American women.